Bani Walid (Anglicized: /ˈbæniː wɑːˈliːd/; Arabic: بني وليد‎ Banī Walīd, Libyan pronunciation: [ˈbæni wæˈliːd]) is a town in Libya. Prior to 2007, it was the capital of Sof-Aljeen District. Bani Walid has an airport. Under the Libyan Arab Jamahuriya, it was divided into two Basic People's Congresses: Dahra – Bani Walid (الظهرة – بني وليد), and Zaytouna – Bani Walid (الزيتونة – بني وليد). It is the home to the Warfalla tribe, the only city in which only one tribe resides. A campus of Bani Walid University is located in Bani Walid. In the Libyan Civil War, after the anti-Gaddafi forces captured Tripoli in August and Sabha in September, Bani Walid, along with Sirte, was one of two final strongholds held by forces loyal to the ousted government of Muammar Gaddafi. There were clashes between anti-Gaddafi forces surrounding the city and Gaddafi loyalists defending it throughout September and early October; the city was finally taken on 17 October. Finnish company Perusyhtymä (today YIT) constructed in the 1980s a factory in the city used for the assembly of rifles and possibly other weapons. NATO reported that it had hit two "command hubs" in the city and one ammunition dump. It is possible that the latter had originally been built by Finns. 200 Finnish engineers and other experts worked in Bani Walid. Some had their families in the area. The "dirty jobs" were done by around 2,000 cheap labourers from the Philippines. In Finland, the media found out the construction of the weapon factory in 1994 and 2011. In the 1980s, Libya was the second-largest country of export for the Finnish construction industry right after the Soviet Union. In the early 1980s Finns had about 20 major construction projects in Libya. In addition to the weapon factory, other Finnish constructions include streets in Tripoli and the entire oil city of Ras Lanuf. A large number of Libyan architects have been trained with Finnish help. Construction export became more difficult after the UN set up a trade embargo in 1992. As late as 2008, a shopping complex designed by Finns was being built. On 23 January 2012, around 100–150 local fighters attacked the main NTC army base in Bani Walid, killing eight NTC fighters and wounding at least 20 others. 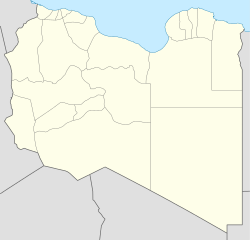 On 25 January 2012, Libya's defense Minister recognised the newly formed local tribal council, which overthrew the local NTC council, as the new authority of Bani Walid. In October 2012, a successful and controversial armed campaign to recapture the city was launched. The city is served by the Bani Walid Airport, located 2 kilometres (1.2 mi) west of the city centre. ^ World Gazetteer. "Libya: largest cities and towns and statistics of their population". Retrieved 15 October 2011. ^ Stephen, Chris; Raufund, Abdul; Smith, David (10 September 2011). "Gaddafi's diehard secret police dig in as Nato jets blast desert stronghold". The Guardian. Tripoli. Retrieved 23 January 2012. ^ Stephen, Christopher; Derhally, Massoud A. (10 September 2011). "Libyan Fighters Suspend Qaddafi Attacks". Bloomberg. ^ Malone, Barry (17 October 2011). "WRAPUP 4-NTC forces celebrate capture of Gaddafi bastion Bani Walid". Reuters Africa. Bani Walid. Reuters. Retrieved 23 January 2012. ^ "'Pro-Kadhafi' attack kills four in Libya". Google News. Tripoli. Agence France-Presse. 23 January 2012. Retrieved 23 January 2012. ^ Holmes, Oliver (24 January 2012). "UPDATE 1-Anger, chaos but no revolt after Libya violence". Reuters Africa. Bani Walid. Reuters. Retrieved 24 January 2012. ^ "UPDATE 2-Libyan government concedes to restive town's demands". Reuters Africa. Tripoli. Reuters. 25 January 2012. Retrieved 25 January 2012.